Last week I participated in a survey with a major technology company that was seeking details on a typical day in the life of our family. While Scott and I are retired, SahmReviews keeps us pretty busy. But we’re mostly at the mercy of the girls’ schedules. With school, homework and their various extra-curricular activities, family time is often limited. As I talked to the tech company on the conference call, I consistently heard myself raving about the relationship we have with our kids. I attribute a lot of our ability to talk about the things that interest or bother them to the fact we spend so much quality time playing board games. When you sit down and play a game, guards are down and everyone is on an even playing field. We are able to have conversations in a setting that isn’t filled with stress. 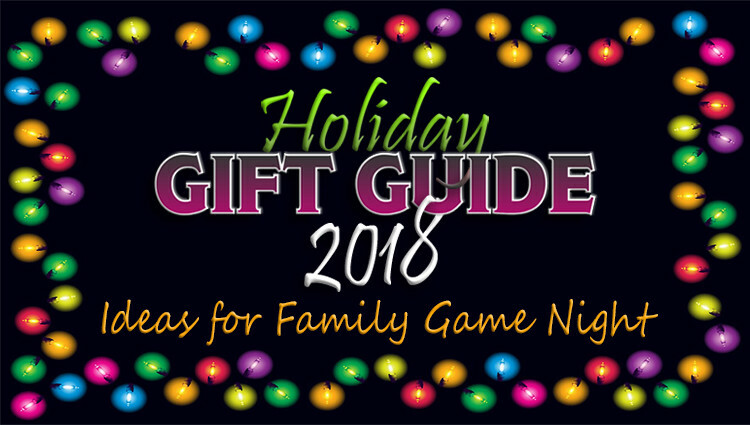 Each year we make a lot of room in our holiday gift guides for games, but we put an emphasis on games to play as a family because we know first-hand the benefits. This is the first of two guides dedicated to family games. As you look through this list, don’t judge a book by its cover. Just because a game may be appropriate for ages 5+ doesn’t mean it isn’t entertaining for the entire family. It simply means that the instructions are easy enough that someone young could figure them out. There are days when the schedule allows us to sit down for a long, in-depth strategy game and other days when we only have time for a quick game as a homework break. There’s a place for all kinds of games in families with kids of all ages and you’ll find that variety displayed right here. If something looks interesting, we encourage you to click on the logo to learn more about that specific game. 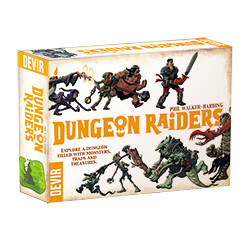 In Dungeon Raiders each player takes the role of a different adventurer. You will have to join forces to survive the dungeon, but only one of you will get out with the most treasure and win the game! In Werewords Deluxe™, there’s additional fun guessing a secret word by asking “yes” or “no” questions before time runs out. 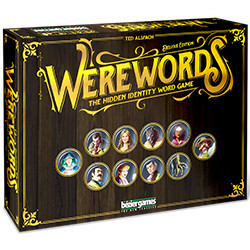 As in the original Werewords, there are players secretly playing as werewolves or villagers or as a seer either hindering or helping the village. In Werewords Deluxe, there are new roles and game modes and you can now play with 2 to 20 players. Do you know the legend of the cherry tree that blossoms every ten years? The story goes that once every decade, the Cherry Tree would shroud itself in beautiful flowers during the first days of spring. Join in with friends to see who can gather the most beautiful flowers. Will you be worthy of having your wish granted? 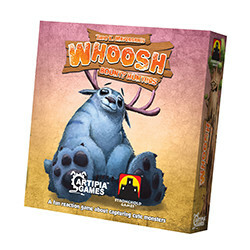 Whoosh: Bounty Hunters is a fun, fast reaction game in which players try to capture cute monsters and collect bounty. Each player has a draw pile of Weapon and Spell cards. Three Monster card piles are at the center of the table, each with a revealed card in front of it. Each Monster requires different Weapons and Spells to be captured. On the Island of Nowhere Atoll, terrifying (but utterly harmless) beasts reside. Can you wrangle the best sets of monsters, nurture them by collecting their favorite foods, and present the most horrifying group of monsters ever seen on the Island? 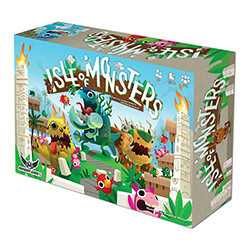 In Isle of Monsters, a set collection, resource-gathering family game, 2-5 players take the role of monster wranglers attempting to gather the scariest team of monsters they can find in order to compete in the local Scare Faire. Getting screams from the audience gets you acclaim, as does scaring the monsters owned by other players. 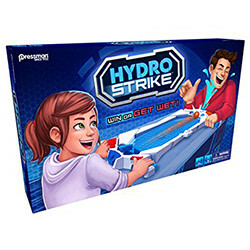 Get ready to make a splash with Hydro Strike! In this head-to-head pinball game, you’ll need fast flipping fingers to shoot the ball into your opponent’s goal. Score and your opponent will get sprayed in the face with water! Since a sprayer is aimed at both players, strike quick when you play, or you’ll get the spray! The first player to score 5 times wins. Will you win or get wet? 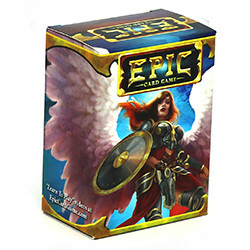 Epic is a fast-paced card game of fantasy combat. 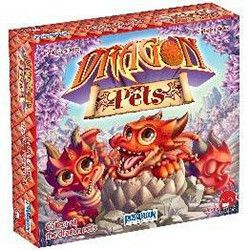 It gives you all the strategic, interactive gameplay of a trading card game at a tiny fraction of the cost. What alignment will you choose: Good, Evil, Sage, or Wild? Two to four players can play out of one $15 deck. And it fits in a stocking! More suspects, more rooms, and more weapons Clue Master Detective is the perfect game for Murder Mystery Parties. Introduced in the 1980’s this super-sized version of Clue adds up to a lot more mayhem! Use your sharpest detective skills to solve the ever-changing mystery! The universe’s best tabletop golfing game! Flick your wacky “golf ball” over 3D obstacles and through over 54 pre-designed holes for your table. You win if you have the lowest score after 9 holes. Then design your own course! For 1-8 players. 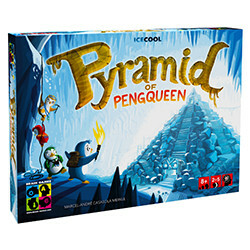 Pyramid of Pengqueen is a strategic game of cat and mouse for children, families, and casual gamers, in which your goal is to collect the treasure before the player playing as the mummy can catch you. 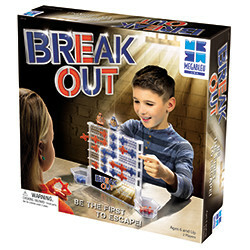 Featuring a double‐sided magnetic board which hides the movement of the players! Everyone gets crazy rich! But who will end up the richest? You have three rolls of the dice to rake in the dough. Then buy amazing investments for your empire! Do you want a candy factory or a pro soccer team, a robotics lab or a movie studio? You decide what risks to take as you collect companies and become a Zillionaire! Buy at Walmart or Walmart.com! 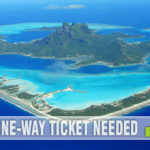 Make Your Escape! Who will break out of prison first? Harry Highjump and Billy Breakout have both had the same idea, but will they get in each other’s way? Each needs to tie a knotted rope to freedom. Who’ll be first to scale the wall and make it over the top? Join together the colored pieces of rope to get your Prisoner from the top to the bottom of the wall. Try to block off your opponent prisoner’s route before he blocks yours. The first to create an unbroken rope to the bottom wins! 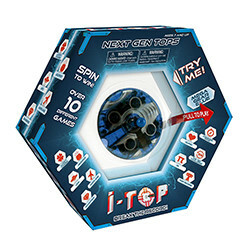 Check out the new generation of tops with i-Top! Using smart technology, this high-tech top keeps track of the number of spins while LEDs light up the display. Spin your way to the top score by competing in multiple challenges. Unlock hidden features by spinning the top an exact number of spins to show special animations, or challenge your friend to a high score. Available in Mega Gear Blue, Infinite Purple and Vortex Red. 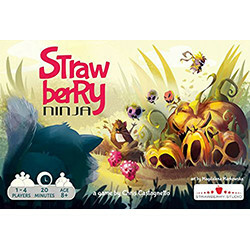 In a place not that far away, a lush garden was invaded by a Strawberry Ninja! The stealthiest berry you’ve NEVER seen! Strange as your garden may be, it’s never good to have a ninja running loose in your backyard, so now it’s up to you (and one brave kitten) to apprehend the rascal! Build the garden, discover its secrets, guide the kitten together! 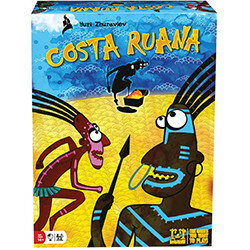 Each game is 20 minutes of cooperative family fun. 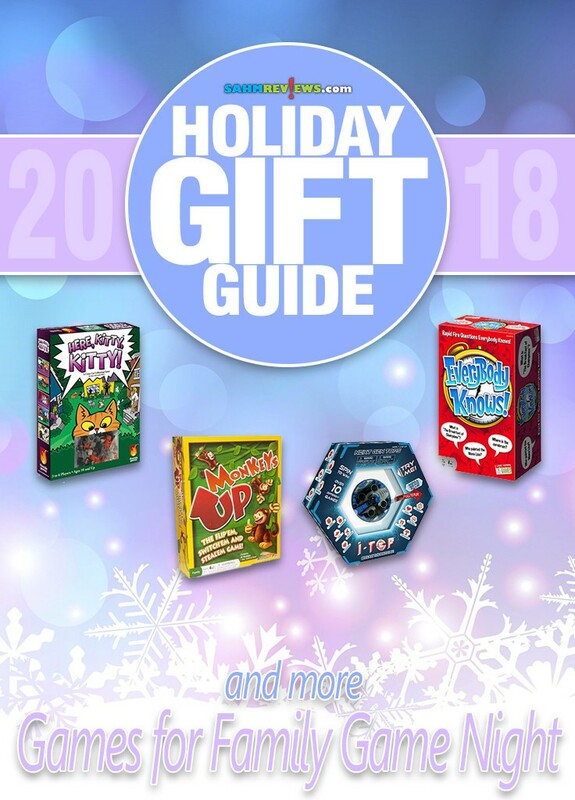 Consider grabbing a couple of these family games for someone on your holiday list and be sure to check out our prior guides that include amazing card games and puzzles for all ages. Over the course of the next couple months, we’ll be launching a giveaway each day for items that have appeared in our gift guides. Watch for most of these games to show up in our Mega Giveaway promotion where you can enter to win a copy. There may be some you’re super excited about or perhaps some games you’re on the fence about, but entering the giveaway doesn’t cost anything except a few minutes of your time so it’s worth it to try! We could sure use some new games for these cold and wet days. These look like some good choices to look at for our family get togethers. This is an awesome guide! I have a brother-in-law who loves board games which is great because my 13 year old daughter loves board games too – he always gets her a board game for Christmas! So many great games to gift this Christmas! 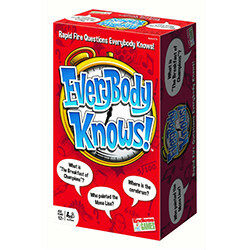 I would love to try Everybody knows and Monkeys Up myself actually, and with my family! Being a cat person Here Kitty Kitty sounds like fun to me. Nice list! I love playing games as a family too, I just need to figure out how to encourage some of my kids to play with the rest of us. I agree it makes it a great time to have discussions without the stress. Thanks for these suggestions, I’ve not heard of most of these. I’ll add them to my wishlist. The tabletop golfs looks really fun. That game would be perfect for my family (who loves golf). Our family loves playing games. The Dungeon Raiders sounds like a game my boys and husband would enjoy playing together. What a great selection! This is a great list. I miss so much playing games with my daughter now that she is far away in college! These are such cute games. Wow, so many games to choose from! My son is a board/card game fanatic. He would love these! I think Here Kitty sounds like fun! All of these games would be perfect! My family would love them all! What a great list of games. I like the Werewords Deluxe and the Break Out games the best. I love these games . A lot of great games to choose from. Thanks for the information, it really helps seeing new and popular games available. I choose a few from the list for gifts myself. I even got one for us. So many games to check out! These games are fantastic and are great for any time of the year. These gift guides are so helpful, thanks! These are very good choices for family games. I would buy any of these. These are great gift ideas! 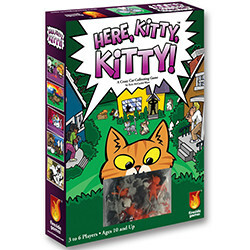 Here Kitty Kitty looks like the most fun! 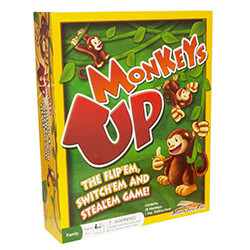 My son would probably like the Monkeys Up game! I am a fan of Monkeys UP already. All these games look like fun and would be great family games! I played CLUE for many years so I would definitely like to check out Clue Master Detective! I’m adding this game to my list. Thank you for sharing this, because I would have never have known about some of these games! My grandkids like playing the game of war. 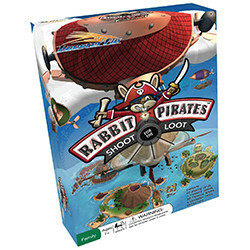 I read that the game, Rabbit Pirates is a lot like war. It would be great to have a new game for family time! Especially one we can all participate in. 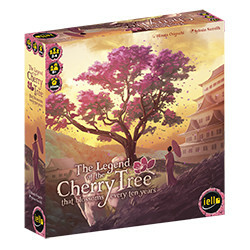 The Legend of the Cherry Tree sounds really interesting. 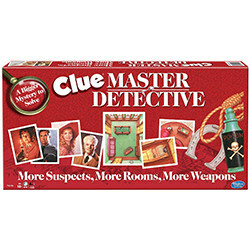 We have Clue Master Detective and really enjoy it with the family. Thanks for the great list! Such a great variety of cool games! It’s been a long time since we got a new game, I think it is time. I haven’t heard of these games, but I definitely want to check out the Werewords Deluxe. 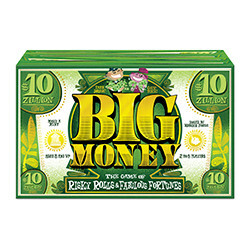 Great gift guide…Big Money looks really interesting! These would be great fun with the husband and the grands! Would be nice to have this on hand for the grandchildren. Wow, so many great ideas for family fun…thanks! Sage looks interesting…. maybe a good use of Christmas cash! I’m apparently sleep deprived…. the title is Epic, not Sage. Not sure what happened there…. 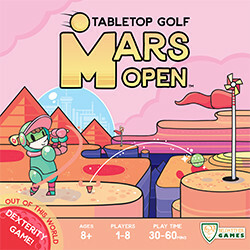 I wanted to check out Mars Open, looks great! These are all great. The Tabletop Golf looks like a great alternative to traditional board games! Awesome list! I will be looking into these for our family game night. Thanks! I’ve heard lots of good things about Werewords, that’s the one on this list I most want to try. weapons Clue Master Detective. It would be the perfect game for Murder Mystery Parties. I enjoy those too! I pinned these games earlier. Super assortment of games to choose from…what fun!